What is the news today?? The Supreme Court rules that apparently racism is a thing of the past, while completely mis-defining tribal identity and threatening native sovereignty. And then Senator Wendy Davis is currently filibustering in Texas to keep draconian abortion laws off the book, too, so that’s cool. Meanwhile, I am reflecting on a protest I attended yesterday at the Suffolk Detention Center in Boston, opposing the massive deportations that happen each week, invisible to the eyes of many Americans, but brutally real to many others. 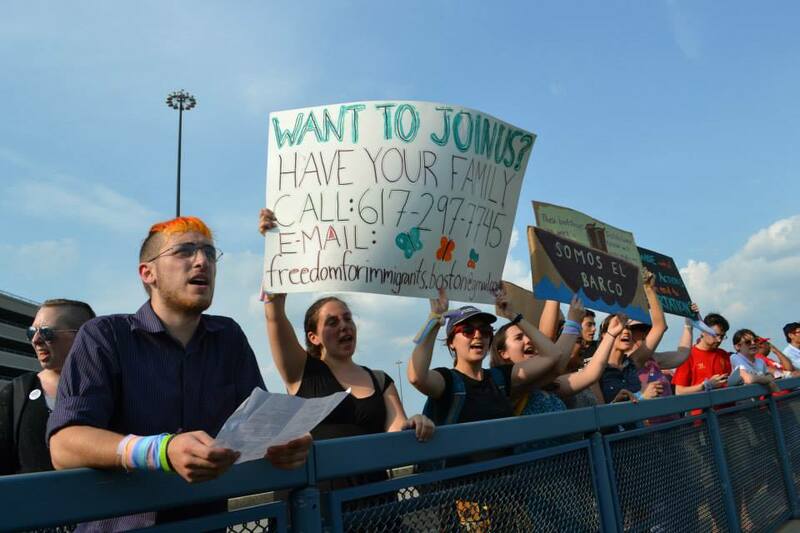 We stood at the intersection of Mass Ave and I-93, 40 or 50 of us within sight of the Suffolk Detention Center, where detainees could see us through their barred windows. We waved and chanted, holding signs showing our solidarity and support; they waved back and banged on the windows, showing signs of their own: ICE 7 Years, and Thank You All. As deportations continue by the thousands and the US sits on the brink of Immigration Reform, we need to be watching. This country doesn’t make it easy for us to watch passively and see the full picture, so we have to look, and we have to listen. Carefully. 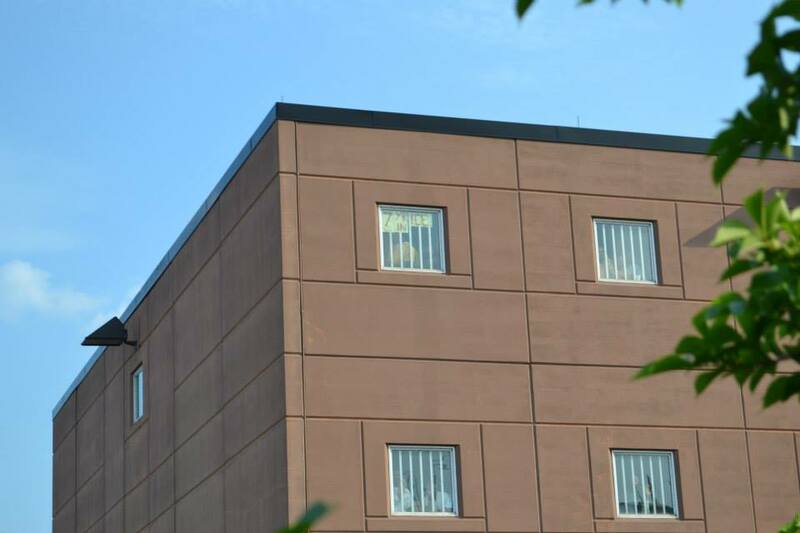 We could see into the part of the detention center nearest the highway, but walking there, we passed walls of windows, which were mirrored on the outside. We could not see in, but the people inside could see out. If we listened, we could hear them banging on the glass, hidden from us. Well who says it’s wrong? The same people hiding them behind mirrored glass. The people in the wrong are not who’s behind the mirror, but those who put the mirror there in the first place. Not one more deportation! ¡Ni una deportación más! I attended the vigil for Jose Antonio on Day of the Dead when I was in Arizona on the Border Studies Program. I was able to see, as the Border Wars article describes, the wall on top of the cliff that separated Border Patrol from the site where Jose Antonio was killed. Whether or not Jose Antonio was throwing rocks at BP agents at the time of his death is a contested detail, and if he was, it is difficult to picture how the rocks could have been “raining down” from Mexico given the geography of the site. The NYT’s use of this type of description allows the Border Patrol to be seen as the victims of violent and agressive Mexicans. Border Patrol likes to be seen this way. This was apparent in my interactions with the Nogales sector of the Border Patrol, who handed us rocks and asked us, “Do you think this would do some damage? Do you think it would hurt?” But Border Patrol is not the victim in this situation. They are heavily armed, and their presence creates an environment of fear and intimidation on both sides of the Border. I hope that this visibility in the New York Times helps end this sort of violence on the Border, but maybe the NYT could invest their time and energy into investigating why this sort of violence is allowed to happen, and why there hasn’t been a single criminal charge of a BP agent since 2010, rather than investing time and energy into crafting sentences that make it sound like the Border Patrol is just barely surviving a hailstorm of boulders. Prison relieves us of the responsibility of seriously engaging with the problems of our society, especially those produced by racism and, increasingly, global capitalism. Operation Streamline embodies this quotation. I saw it in action today in a courtroom in Tucson. Operation Streamline resulted from the creation of a “zero-tolerance” immigration policy, in which people entering the US for the first time without documentation are charged in criminal court with a misdemeanor, and people entering for the second (or third or fourth) are charged with the felony of reentry after deportation. The “Streamline” part of the Operation is that 70 people are tried and sentenced in the space of 2 hours, in the same courtroom, within days of being detained. If that doesn’t sound constitutional to you, well, it doesn’t to me, either. Apparently the courts that have addressed the constitutional question have said effectively, “no harm, no foul, let Operation Streamline continue.” The Supreme Court hasn’t said anything about it. Yet. He calls groups of eight forwards. They are chained at the wrists and ankles, wearing the same clothes they were detained in, earphones for the Spanish interpretation dangling from their ears. The process is fast: they say “sí, sí, no, no, culpable, no,” affirming their names, giving up their rights, admitting their guilt, and away they are led, through a door, but not before their attorneys pull the earphones out of their ears, because most can’t reach, thanks to the chains. Most are sentenced to time already served. They will be deported. Others are sentenced for any number of days: 30, 60, 100. Afterwards, they’ll be deported. At one point, the prosecutor speaks up. “Your honor, this defendant has past charges; the state requests that he be sentenced to five days in a correctional facility.” The judge grants the request. Why? Why bother? What does five days in a jail matter? Or 100, for that matter? What’s the mentality behind sentencing these people to prison or deportation for entering the country illegally? These people aren’t coming to play a sneaky trick on the citizens of the United States. They’re walking through the desert for days to find jobs to feed their families, because it’s the only way to have some hope of survival, thanks to the US decimation of the Mexican economy. Incarceration doesn’t solve the problems of economic policies like NAFTA allowing the US to flood the Mexican market with subsidized corn, outcompeting Mexican farmers and leaving them with no means of income. Operation Streamline meets no logical end to an actual problem. Instead, what it does is feed the prisons – prisons owned by for-profit, public corporations, which depend on the US government paying them millions of dollars per month to hold inmates. These corporations can build huge correctional facilities and then lobby for new legislation that fill their beds. The legislation is popular because it “fights crime” and builds the economy. The southwest economy is built on border militarization. Prisons and law enforcement agencies and the US Marshall create jobs. Jobs that rely on racist and dehumanizing operations like Streamline.